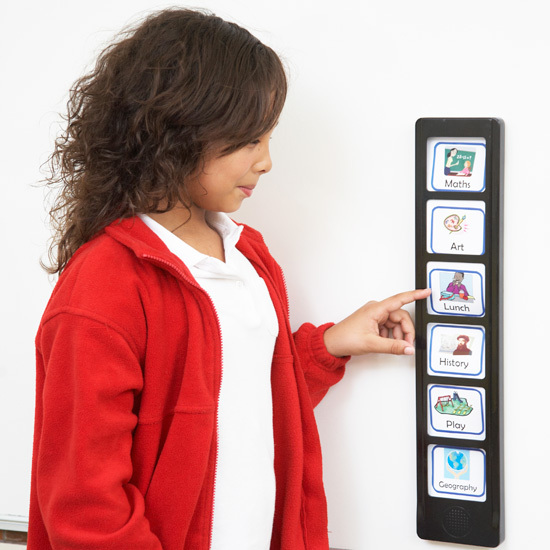 Create talking stories, class timetables or questions and answer games on this recordable bar. Children or teachers can slot in up to six of their own images or words and then record a corresponding 10 second message per slot, and then just press to play back. Ideal for hanging on the wall and perfect for sequencing activities, eg: the events of the story. Great for children with autism to use as a visual timetable to organise their day. Also available in the handly version ChatterBox 30. Bar size: 11.5 x 56cm. Insert size: 7 x 8cm. Use it as a base for your boards with the Sequence bar communicator.